Peace of mind is easy to find at the airport’s gate. I’ve entered the Airport in San Salvador, going to the US. It’s located nowhere. It doesn’t look and feel like El Salvador. 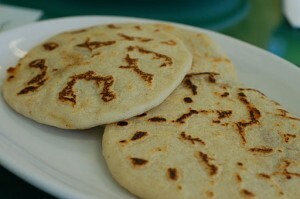 Pupusas, Salvadorans are obsessed with pupusas. Here, no pupusas anymore, Subway sandwiches instead. The country’s heat has also been replaced by the AC. Cool artisanal ads don’t cover the walls with their screaming colors, they’re not clean enough for an airport, I guess. Only boring posters with corporate handshakes, smiling happy faces or luxury products. I’m now in the airport’s international zone, the bleached, secure area where nothing happens. I might be bored to tears but at least no bad surprise can happen here. And nobody knows me. Nobody gives a damn who I am. As the plane finally takes off, there’s that feeling of being pulled up so hard my guts are staying on the ground. My neighbor on the left is a real nice guy. We keep talking as he orders wine constantly. The entire flight. We talk some more. He doesn’t seem to be affected by alcohol, I’m wondering how many gallons of Pinot he can stomach before puking everywhere. I have to connect in Atlanta. There, I meet the “Homeland security” officers (you have to talk to these guys if you want to be accepted on the US territory). I’m not welcome this time, I can tell. The officer in front of me asks a loads of dumbass questions. When I’m done answering, he asks them again. Then I’m sent to an interview with another officer. Things will turn out good for my case, but I get to see how they treat others. That’s not pretty. A latino is interrogated in front of me. The guy doesn’t speak english so they call a translator. The officer tells the latino that he doesn’t buy what he says. He raises his voice. The latino guy tries to smile, in an impressive effort to be nice. The translator converts all the bullying back to spanish, along with the angry tone and all. It’s pretty interesting: these people are paid to intimidate others. “Go sit, I’ll take your hat, I don’ t want to see you with a hat, now”. The officer takes the guy’s hat. Puts it on a table behind him. Confiscated. The latino goes back and sits quietly. God knows what’s next. They’ll probably send him back to his country. I leave the office with my passport, I didn’t say anything to stop what I just saw. I postponed my avenger’s life once more. 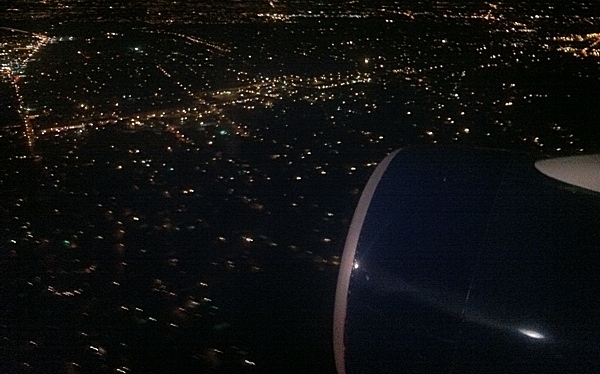 Night has fallen, my plane to NYC is about to land. I don’t really think. I’m happy to see Vilma again.